- Publisher Do the ancient rules and regulations of Leviticus have anything to say to Christians today? In this compelling examination of Leviticus, George A.F. Knight demonstrates the validity and importance of this book for our faith. "We discover in Leviticus," writes Knight, "the meaning of the atonement, the meaning of holiness, the meaning of priestly representation, the true significance of the Sabbath.... The theology that we meet within the book of Leviticus must necessarily continue to apply to the life of the Church ... simply because it applies to the life and work of Christ himself." Book jacket. 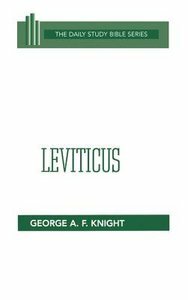 - Publisher In this compelling examination of Leviticus, George A. F. Knight demonstrates the validity and importance of the book of our faith. About "Leviticus (Daily Study Bible Old Testament Series)"
Do the ancient rules and regulations of Leviticus have anything to say to Christians today? In this compelling examination of Leviticus, George A.F. Knight demonstrates the validity and importance of this book for our faith. "We discover in Leviticus," writes Knight, "the meaning of the atonement, the meaning of holiness, the meaning of priestly representation, the true significance of the Sabbath.... The theology that we meet within the book of Leviticus must necessarily continue to apply to the life of the Church ... simply because it applies to the life and work of Christ himself." Book jacket. In this compelling examination of Leviticus, George A. F. Knight demonstrates the validity and importance of the book of our faith.